Observations of two galaxies made with the National Science Foundation-funded Atacama Large Millimeter/submillimeter Array (ALMA) radio telescope suggest that large galaxies formed faster than scientists had previously thought. The two galaxies, first discovered by the South Pole Telescope at NSF's Amundsen-Scott South Pole Station in Antarctica, were massive and star-filled at a time when the cosmos was less than a billion years old. The observation came as a surprise, considering astronomers had thought that the first galaxies, which formed just a few hundred million years after the Big Bang, were similar to today's dwarf galaxies -- collections of stars much smaller than the Milky Way. After a few billion years, these early, smaller galaxies became the building blocks of the larger galaxies that came to dominate the universe, scientists believed. But the latest ALMA observations push this epoch of massive-galaxy formation back further into the past, as the two galaxies were giants when the universe was only 780 million years old. ALMA also revealed that these large galaxies were nestled inside an even-more-massive cosmic structure, a halo of dark matter several trillion times more massive than the sun. The discovery provides new details about the emergence of large galaxies and the role that dark matter plays in assembling the most massive structures in the universe. "With these exquisite ALMA observations, astronomers are seeing the most massive galaxy known in the first billion years of the Universe in the process of assembling itself," said Dan Marrone, an associate professor of astronomy at the University of Arizona in Tucson and lead author on the paper, whose research received NSF support, including an NSF CAREER grant. Viewing distant galaxies means looking back through time, in a sense. The energy from those objects takes so long to reach Earth that researchers today view events that occurred billions of years ago. The astronomy team captured data from these two galaxies as they were during a period of cosmic history known as the Epoch of Reionization, when most of intergalactic space was suffused with an obscuring fog of cold hydrogen gas. As more stars and galaxies formed, their energy eventually ionized the hydrogen between the galaxies, revealing the universe as we see it today. The observations showed the two galaxies in such close proximity -- less than the distance from Earth to the center of our galaxy -- that they were certainly on course to merge and form the largest galaxy ever observed in the Epoch of Reionization. "We usually view that as the time of little galaxies working hard to chew away at the neutral intergalactic medium," said Marrone. "Mounting observational evidence with ALMA, however, has helped to reshape that story and continues to push back the time at which truly massive galaxies first emerged in the universe." The galaxies that Marrone and his team studied, collectively known as SPT0311-58, were originally identified as a single luminous source by the 10-meter South Pole Telescope (SPT) survey. SPT is supported by NSF's Office of Polar Programs, which manages the U.S. Antarctic Program. 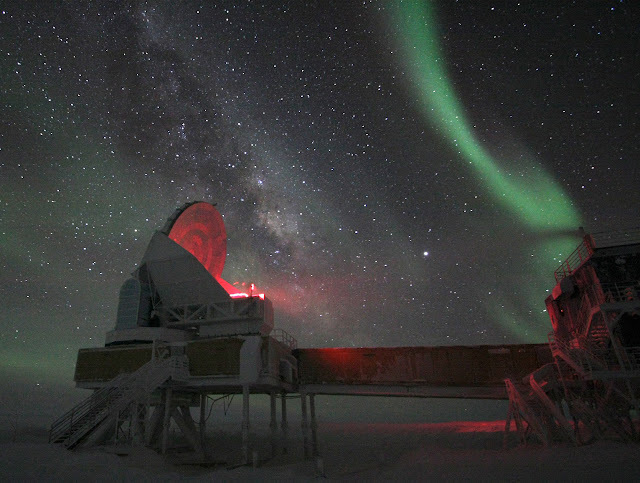 "These discoveries are made possible by close cooperation between NSF's Division of Astronomical Sciences and Office of Polar Programs, both supporting the ALMA and SPT facilities; such cooperation will be essential to achieving the goals of Windows on the Universe: The Era of Multi-messenger Astrophysics, one of the "10 Big Ideas for Future NSF Investments," said Vladimir Papitashvili, NSF program director for Antarctic Astrophysics and Geospace Sciences. These first observations indicated an object was very distant and glowing brightly in infrared light, meaning that it was extremely dusty and likely going through a burst of star formation. Subsequent observations with ALMA revealed the distance and dual nature of the object, clearly resolving the pair of interacting galaxies. This "de-lensing" process provided intriguing details about the galaxies, showing that the larger of the two is forming stars at a rate of 2,900 solar masses per year. It also contains about 270 billion times the mass of our sun in gas and nearly 3 billion times the mass of our sun in dust. "That's a whopping large quantity of dust, considering the young age of the system," noted ALMA team member Justin Spilker, a recent graduate of the University of Arizona and now a postdoctoral fellow at the University of Texas at Austin. The astronomers determined that this galaxy's rapid star formation was likely triggered by a close encounter with its slightly smaller companion, which already hosts about 35 billion solar masses of stars and is increasing its rate of starburst at the breakneck pace of 540 solar masses per year. The researchers note that galaxies of this earlier era are messier than the ones we see in the nearby universe. Their more jumbled shapes would be due to the vast stores of gas raining down on them and their ongoing interactions and mergers with their neighbors. "If you want to see if a galaxy makes sense in our current understanding of cosmology, you want to look at the dark matter halo -- the collapsed dark matter structure -- in which it resides," said Chris Hayward, an associate research scientist at the Center for Computational Astrophysics at the Flatiron Institute in New York City who provides theoretical support for the ALMA follow-up of SPT-discovered galaxies. "Fortunately, we know very well the ratio between dark matter and normal matter in the universe, so we can estimate what the dark matter halo mass must be." "There are more galaxies discovered with the South Pole Telescope that we're following up, and there is a lot more survey data that we are just starting to analyze. Our hope is to find more objects like this, possibly even more distant ones, to better understand this population of extreme dusty galaxies and especially their relation to the bulk population of galaxies at this epoch," said Joaquin Vieira, an assistant professor of astronomy at the University of Illinois at Urbana-Campaign and member of the SPT team whose study of SPT-discovered galaxies is funded through NSF's Astronomy and Astrophysics Research Grants program. "In any case, our next round of ALMA observations should help us understand how quickly these galaxies came together and improve our understanding of massive galaxy formation during reionization," Marrone said.